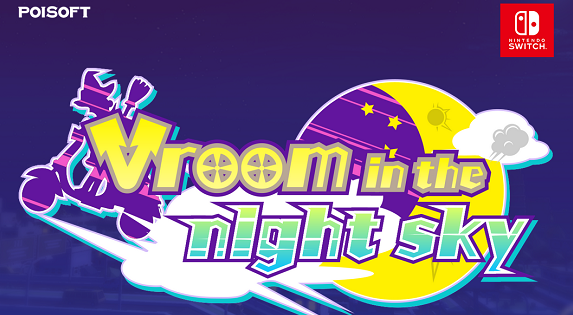 In this post, you will find everything there is to know about the Software updates for Vroom in the night sky on the Nintendo Switch (originally released on March 3rd 2017 in Japan, March 9th 2017, and April 5th in North America). How to download updates for Vroom in the night sky for the Nintendo Switch? To check that you have the latest version installed, simply launch the game: the version number is displayed just below the Title Screen. It should read Ver. 1.1.0.
adds a Driving School. This allows you to learn how to control your magical bike. There’s 10 missions, and you can get some stardust when clearing them (though only the first time around). You could use it to buy your very first Magical Bike. lowers prices of the Magical Bikes. If you already bought one, the shop will give your money back. Best Record: the game will now save your Best Record. you can now access the Operation manual from the Title Screen. fixes an issue with collision detection on the “Night Sky of the Resort Mood” stage, that would cause player to fall under the ground. Notes: the North America version of the game launches with Ver. 1.1.0.